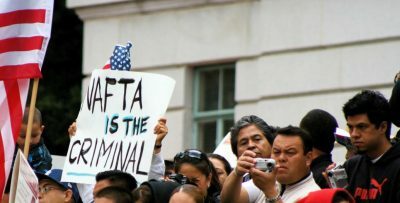 While the full text of the United States-Mexico-Canada Agreement (USMCA) needs to be thoroughly analyzed, a preliminary review raises numerous concerns. It’s not surprising that the words “climate change” do not appear in the text, but that doesn’t make that reality any less unacceptable. There is nothing in this agreement that constrains the power of Big Oil or that keeps carbon emissions from exceeding the 1.5 degrees Celsius limit. Nor do the words “free, prior and informed consent” for Indigenous nations appear in the agreement. This fundamental right is ignored. And the patents for transnational pharmaceutical corporations will be extended — for biologics from eight years to 10 years. That means more profit for Big Pharma corporations and higher drug prices for people. Given Trump has already announced that the U.S. is withdrawing from the Paris Agreement, and the Trudeau government just bought a carbon-intensive pipeline, these words carry little meaning. There is no reference to the United Nations Declaration on the Rights of Indigenous Peoples. This two-year increase will serve only to profit Big Pharma and make pharmacare that much more expensive to implement. Given both Trudeau and Trump support the dangerous practice of offshore oil and gas drilling, this language is pure spin. This is not the “progressive” trade agreement that the Trudeau government had promised (even if that was also largely spin on its part).